Our ‘Backpackers Flat’ has a dorm (4 beds) and a double room, with shared bathroom. There are another 2 beds (bunk bed) in the passageway, so the flat sleeps a total of 8 people. The unit contains a fully equipped kitchen, a comfortable lounge, TV and free Wi-Fi. Sea side accommodation with a great vibe! Cristal Cove will exceed your expectations in every way. 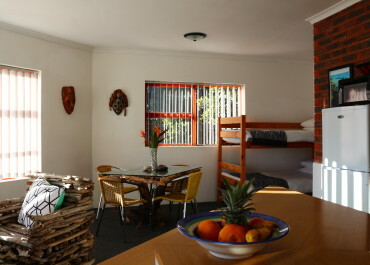 Our accommodation consists of five cozy self-catering units. 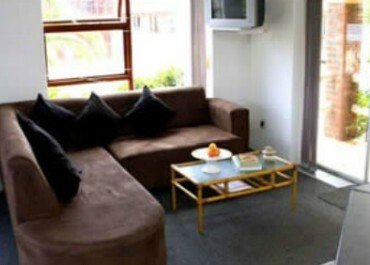 Each unit has two rooms, fully equipped kitchen and dining area, comfortable lounge with flat screen TV and free WIFI. The units can be booked as a whole for families or a group of friends, or you could book just a room or a single to mingle dorm bed. © 2019 Copyright by Cristal Cove. All rights reserved.